Here are a few answers to some of the questions we're asked frequently as a result of this site. There's also a whole load of stuff which I'm not asked but have stuck in here anyway. Where can I get teletext? Why's teletext so slow? Why can't I just flick through the pages? How are the images on your site saved? I'm writing some software to do with teletext, where can I get more specific information? Teletext consists of pages of information, such as news and sport, which are viewed on a television set capable of viewing these pages. Its roots lie in the 70s, when the BBC and Oracle started the first test services. The actual teletext pages are broadcast in a hidden part of the television signal (the Vertical Blanking Interval), and decoded by the television. Teletext pages are accessed by a 3-figure number; on most channels, the front page is on page 100. As well as news and sport, teletext contains financial information, such as the latest share prices, recipes, entertainment listings, holiday adverts, cinema, music and TV reviews, back-up information for certain TV programmes, and themed magazines, e.g. for kids. Teletext also broadcasts subtitles (better known in the United States as 'closed captions') on certain programmes, and news flashes which are overlaid on top of the TV picture. The BBC's Ceefax was the world's first teletext service. It can be found on BBC One and BBC Two as part of their 'traditional' analogue transmissions. The BBC Two service contains slightly more information - as a result, it's a bit slower. For the time being BBC News 24 also broadcasts a special version of Ceefax via digital satellite and some analogue cable systems, which contains the news and sport stories for all regions. BBC Parliament's service is named Parliafax. Apart from that the new digital services do not now carry teletext. Instead they carry the new high resolution 'interactive' BBCi service. The service named Teletext is broadcast on analogue ITV and Channel 4. The service itself is independent of those channels, and is operated by Teletext Ltd., which is partly owned by Associated Newspapers, who own the Daily Mail. ITV and Channel 4 are legally obliged to carry Teletext on their signals by the Broadcasting Act 1990. 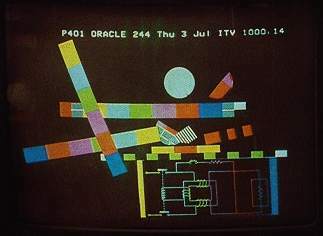 Teletext replaced Oracle at the beginning of 1993, after they were awarded the new Public Teletext Service license by the Independent Television Commission. Channel 4 is also on digital satellite - on this platform, Channel 4 doesn't broadcast Teletext as they're not obliged to. 5 Text broadcasts on Channel 5. As with Teletext, it is theoretically independent of its hosting channel. 5 Text's feel is very similar to Sky Text, as it is operated by Sky Five Text Ltd., owned by BSkyB and Channel 5. Although the carriage of 5 Text is legally the same as Teletext, it is carried on digital satellite, obviously because of the owners' interests in it. 5 Text is BSkyB's only foothold in analogue terrestrial TV. ITV, Channel 4 and Channel 5 all broadcast their own pages which are distinct from the main services. Channel 5's ancillary service, however, is named after the main service which they part-own, and is similar in look. ITV's ancillary service is run by each ITV franchise individually, although there are certain pages which are shared between regions. As it's often named after the ITV company operating it, such as 'Meridian Text' or 'Carlton Plus', it's generally referred to as just 'text' when mentioned on-air. ITV's own service is on page 600, C4's ancillary service - 4-Tel - on page 300, and Channel 5's 500. The latter two are also carried via digital satellite (which ITV isn't on). Intelfax are the company commissioned to provide 4-Tel and most ITV ancillary services, as well as the services on many other channels. Data Design are another teletext provider, whose services include MTV-Text. Ceefax is a product of BBC News and Current Affairs. I'm not sure who operates SkyText and the main and ancillary 5 Text services. A station broadcasting teletext. All of the UK's analogue terrestrial channels broadcast teletext; some cable and satellite services also carry teletext services. Digital terrestrial TV does not. There are also various teletext-to-Web gateways - that is, you view the teletext pages in your Web browser over the Internet. The BBC don't broadcast Ceefax on the Web. However, they do license parts of the service, such as the weather, from other companies; this same information may be licensed by the BBC or others for their Web sites. As I see it, though, the BBC have no excuse for not publishing the parts of the service which aren't licensed - for example, the 'TV Links' section, which provides backup information for BBC programmes, often contains information which doesn't exist on the BBC's Web site. Similarly, the majority of Teletext's pages aren't on the Web. They do, however, publish their holiday adverts, as well as flight arrivals. For a list of Web sites carrying teletext, see the teletext live page. It strikes me as strange that whilst newspapers are widespread on-line, that none of the main UK services, which are transported in electronic form to start with, are available. True, it does look crap. The thing is, most people don't care - but the majority of people just don't notice its limitations. The computer press often likes to bash teletext, branding it defunct because of its looks. This is in spite of the fact that over 22 million people look at teletext every week (ITC), that it needs no technical expertise, and that it's free of subscription and phone charges. The blocky graphics have been addressed. 'HighText' - teletext level 2.5 - provides more colours and simple, but smoother, graphics. In the UK, TV manufacturers and teletext providers have both ignored it in a chicken-and-egg scenario. Not only that, but if teletext providers used all the extra features, it'd slow the service down. And now that digital TV has launched in the UK, it looks unlikely that the providers will invest anything into updating the analogue teletext services. If your TV is newish, it may support HighText - Arte, ARD, ZDF or 3sat (on Astra 1.. and others?) have enhanced some of their pages. Why is teletext so slow? Why can't I just flick through the pages? When you key in a page number to look at, the broadcaster would have to know what page you've just requested so that they can broadcast it. Of course, they don't know this - there's no way of feeding your page number back to the broadcaster (although this is possible with cable). So the solution is to broadcast all the pages, rotating them around (a data carousel). Once you have keyed in a number, your TV sits around, waiting for the page to be broadcast so it can show it to you. This is why the services on channels which broadcast many pages are slower. Whether you can flick through the pages or not depends on how much memory your TV has, and how many pages have actually been broadcast since you tuned in. When viewing teletext on a computer, it is common for the software to cache many more pages than possible on a television. As a result, after have tuned to a channel for half a minute or so, it is possible to flick through the majority of pages. What is the future of teletext? Digital television has 'digital teletext'. Despite the name, the only thing common to 'analogue' teletext is the fact that the viewer looks at information on the TV screen. The methods used to broadcast and decode it, as well as the way it looks, are much removed. Some channels on SkyDigital, the UK's digital satellite operator, carry analogue teletext despite the promise of digital teletext. Sky's own-brand channels carry an expanded version of SkyText, although it directs viewers to the Sky Electronic Programme Guide instead of carrying TV listings. Channels on the UK's digital terrestrial channels don't carry analogue teletext. This was due to a decision by The Digital Television Group (DTG), who decided that such things were unnecessary. In the long term, this is probably true. Teletext Ltd. will be provides a service on channel 9 of digital terrestrial television with the BBC Text on channel 10. To complicate things for the providers of digital teletext, the systems opted for by Sky and DTG are different. Whilst DTG decided to use MHEG-5, which is an ISO standard, Sky decided on OpenTV. OpenTV is a proprietary 'solution for digital interactive receivers'. Teletext has a demo of Digital Teletext on their web site; the BBC also has some information on their digital site and in a paper (in PDF format). Since the early 1990s I have been using either an Optimum Tecnology OPT-III PC teletext card and a Hauppauge Win/TV pci card using VTplus software. This allows copy and export in BMP format. I then use Paintshop Pro to produce GIF files, which are typically around 5-6kb in size per frame. Some images are larger, being animated GIFs consisting of multiple sub-pages. Some of images are taken from pages broadcast live on television or recorded onto VHS tape and captured using the Hauppauge card. These images are of poorer quality due to the state and age of the tapes used and not due to any problem with the hardware. It is sometimes possible to decode teletext data from old S-VHS recordings and we are currently appealing for the loan of any old S-VHS recordings you might have which might yield such data. Some of the teletext pages have been donated by others, the full roll of honour is on the credits page. Some of these were captured using a BBC Model B computer with the Acorn Teletext Adapter, produced in conjunction with the BBC. We have taken the raw teletext files, in Acorn TFS format or !Hearsay format and converted these into a format readable by VTplus using custom software developed by Darren Meldrum using BBC Basic(86) on a Pentium 133 under Windows 95. Some pages have been reconstructed from printed versions. In these cases Richard Russell's excellent Videotex software has been used to produce exact representations of the original pages. Robin O'Leary goes into some detail with his Teletext Transmission Details. Philips have many teletext-related PDFs on their site. You could also check the links page to see if there's anything else there.